The Glorious Grace funeral wreath is a delicate expression of sympathy that will bring warmth and love during the final farewell. Send this wreath and honor the life of the deceased in Brazil. 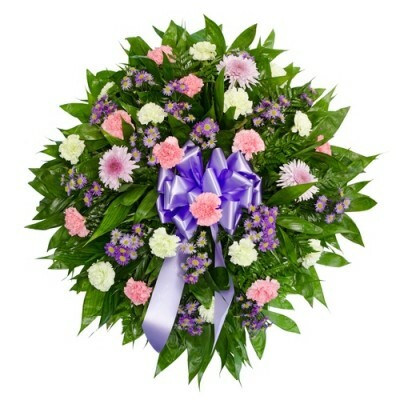 The Glorious Grace funeral wreath will include lavender mums, pink and white carnations and lush greens. Floresnaweb will chose the freshest blooms of lavender, pink and white flowers to honor the life of the deceased in Brazil. Substitutions may be necessary to ensure the wreath is delivered on a timely manner depending on availability.